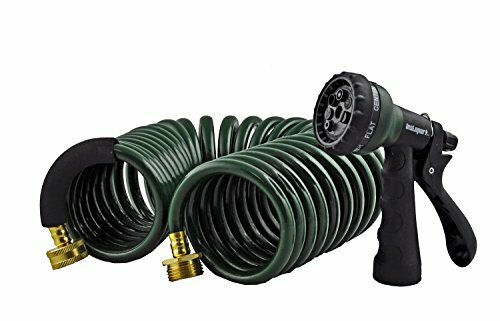 Made of lightweight, yet strong and durable premium EVA materials, the Instapark GHN-06 garden hose attaches to any standard (GHS) garden water faucet and features a unique coiled design that reaches as far as 25 feet when fully extended and coils back to its original compact size for easy and convenient storage, ideal for daily gardening, general cleaning, car washing, and etc. Unlike conventional rubber hoses, the GHN-06 doesn't kink or tangle, it's flexible, easy and effortless to use and handle, an efficient and effective tool to have around the house. For an unbeatable value and added convenience, the GHN-06 also comes with a pressure-adjustable spray nozzle with 7 selectable patterns, which include Flat, Center, Jet, Shower, Cone, Full and Mist, suitable for different types of applications. Lightweight, yet strong and durable and UV-resistant EVA construction and coiled design for kink-free, tangle-free, hassle-free, effortless handling, ideal for outdoors, gardens, yards, lawns, greenhouses, flowerbeds, and etc.